This is the ninth and final 2015 FALL COLOR REPORT for New York State. Reports are obtained from field observers and reflect expected color conditions for the coming weekend. FALL COLOR REPORTS are issued every Wednesday afternoon. Peak colors will reach their final destinations in New York State in the Hudson Valley, Finger Lakes, New York City and on Long Island, according to spotters for Empire State Development's I LOVE NY program. In New York City, spotters at Pelham Bay Park in the Bronx predict peak conditions for this weekend with 60 percent color change and bright orange, red and yellow leaves. 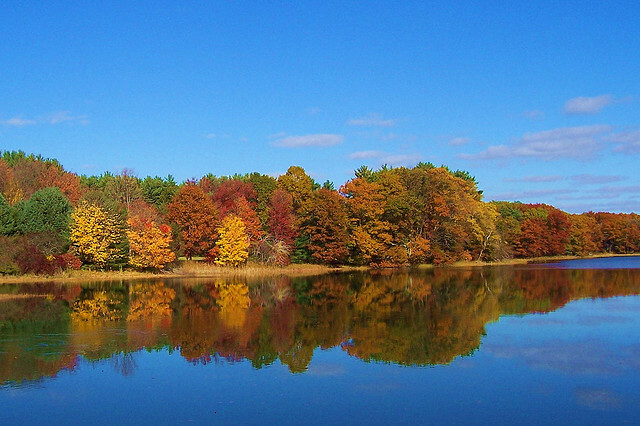 On Long Island, peak colors should remain through the weekend in Suffolk and Nassau counties. Spotters reporting from Riverhead predict 85 percent color change by the weekend. Leaves are getting brighter and showing more contrast, with predominating colors of yellow, orange, red, purple and brown. Spotters in Nassau County reporting from East Meadow predict peak colors for most areas, with all colors on display. Some areas around ponds and lakes are past peak. In the Hudson Valley, peak colors have arrived in Westchester County. Look for 60 percent color change with the predominating color of yellow. In Ulster County, Kingston is just past peak with some good color remaining. In the Finger Lakes region, Yates County will be at peak with 90 percent color change and bright brown and yellow leaves, along with some shades of red and a few trees yet to change. Seneca County will be near peak this weekend, with peak foliage predicted to arrive late next week. Other areas of the state are now past peak. This is the final New York State Fall Foliage Report for 2015. This is the seventh 2015 FALL COLOR REPORT for New York State. Reports are obtained from field observers and reflect expected color conditions for the coming weekend. FALL COLOR REPORTS are issued every Wednesday afternoon. Albany, N.Y. - Bright and beautiful peak fall colors continue to appear across New York State and will dominate the Hudson Valley this weekend, according to observers for Empire State Development's I LOVE NEW YORK program. Also look for peak and near peak color this weekend in the Finger Lakes, Greater Niagara, Long Island and Thousand Islands-Seaway regions. Brilliant peak colors will be found throughout the Hudson Valley region this weekend. Columbia County spotters based in Hudson expect peak leaves with 90 percent change and bright shades of yellow, orange and red. Dutchess County will be at peak with 80 percent color change and bright, vivid shades of gold, orange and yellow. Look for more color near the Taconic Parkway, less color near the Hudson River. In Rockland County, peak foliage is predicted for the New City area, with 85 percent color change and mostly vibrant colors of purple, orange, red and yellow. Also in the county, spotters at Bear Mountain forecast peak colors to hold on through the weekend with 90 percent color change and bright red, orange and yellow leaves. 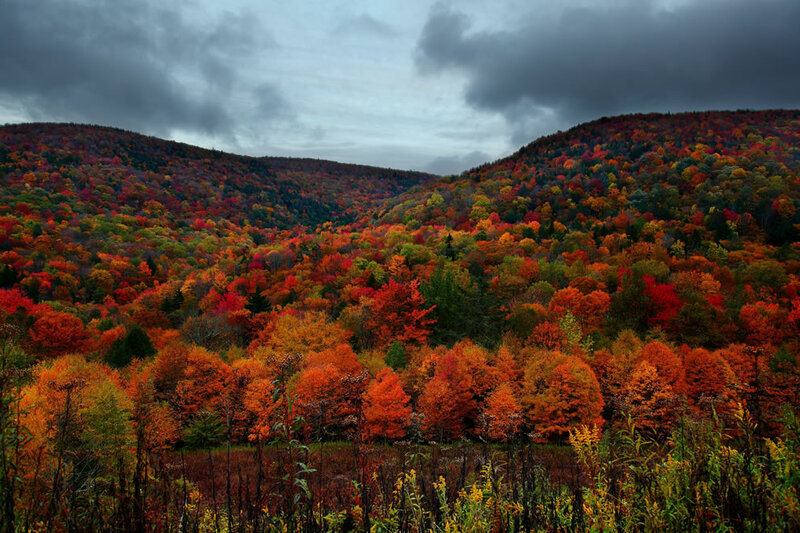 Peak foliage will arrive in Orange County. Goshen area spotters predict nearly complete leaf transition and average to bright yellow, red, pumpkin, lime, wine and peach leaves. Westchester County foliage spotters based in White Plains are predicting leaves at midpoint of change with 50 percent color transition and a full range of fall colors, including yellow, orange and red. Look for a wide range of foliage conditions in the Finger Lakes this weekend. Livingston County spotters reporting from Geneseo project peak leaves with 75-80 percent transition and brilliant, beautiful leaves of gold, rust and fiery red tones. Ontario County is also predicting their leaves to be at peak this weekend with 40 percent change and bright red, orange and gold leaves. Steuben County spotters in Corning expect peak leaves with nearly complete color transition and very brilliant yellow and gold tones, along with shades of orange and red. 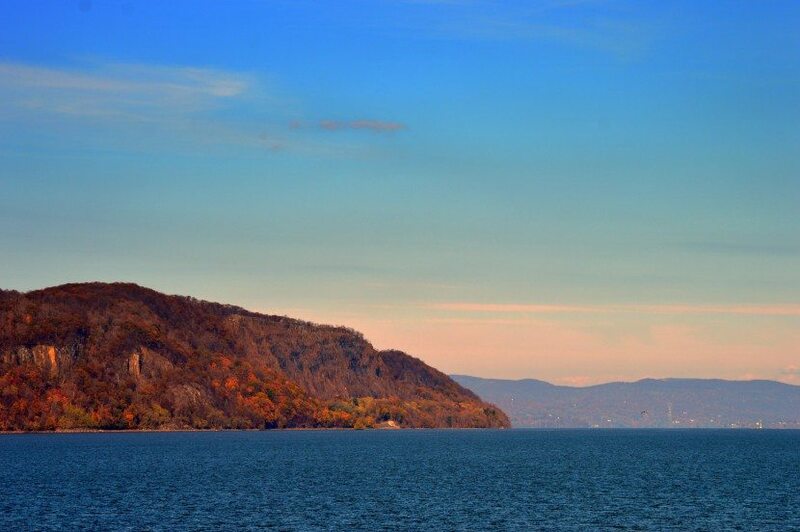 Ithaca spotters in Tompkins County expect nearly complete color transition and peak leaves of bright shades of red, orange, yellow, brown and some green. Cayuga County will be near peak with 75 percent leaf change and very brilliant gold, red and orange leaves. Cortland County will also be near peak with 75 percent transition and bright red, orange and green leaves. Look for near peak foliage in Monroe County where Rochester-based spotters expect 65-80 percent color change. Colors become more intense farther away from areas around Lake Ontario. Predominating colors are bright to average olive green and yellow with some shades of red and orange. Seneca County spotters are calling for midpoint foliage conditions with 40-45 percent change and shades of yellow and orange leaves of average brilliance. Wayne County will also be at midpoint of change with 45-55 percent color change and yellow and orange leaves of muted brilliance. Yates County will be at 40 percent change with shades of orange and red coming on strong. Onondaga County will be peak to just past peak this weekend. Spotters reporting from Syracuse expect 60-70 percent color transition and bright yellow, red and purple leaves. Tioga County will be past peak with some average to brilliant fall colors of yellow and orange remaining. In the Greater Niagara region, expect peak color in Genesee County this weekend. Spotters in Batavia expect 90-95 percent color change and a mix of bright orange, red and purple leaves. Peak to just past peak leaves will fill Wyoming County this weekend. Look for 80 percent color change and red and orange leaves predominating and some good colors, particularly in Letchworth State Park. Erie County will be near peak to peak this weekend with about 50-60 percent leaf change and some beautiful shades of yellow and red emerging. Niagara County spotters reporting from Niagara Falls expect near peak leaves with 60 percent color change and a wide range of bright colors. Orleans County will also be near peak. Spotters in Albion project 75 percent color transition and gold and green leaves with increasing amounts of red leaves. Fall colors have really taken off on Long Island over the past week. This weekend, look for near peak leaves in Suffolk County, where Riverhead spotters expect 60 percent leaf transition and brightening shades of yellow, orange, red and purple leaves. In Nassau County, spotters in East Meadow are also predicting near peak foliage for the weekend with 50-60 percent color change and bright yellow, orange, red and purple leaves. In New York City, color transition is still minimal and leaves will be just 20-25 percent changed by the weekend, with shades of yellow, gold and red continuing to emerge. Colors advanced quickly over the past week in the Capital-Saratoga region and most areas are now just past peak with some good color remaining for the weekend. Saratoga County spotters reporting from Saratoga Springs project just past peak conditions this weekend with 90 percent color change and bright shades of yellow, red, orange and green. In Rensselaer County, expect peak to just past peak leaves in the western and southern portions of the county with 90-100 percent leaf change and a mixture of bright and soft shades of red, orange and yellow. The northern and eastern portions of the county are now entirely past peak. Albany County spotters reporting from Cohoes predict just past peak foliage this weekend with yellow, orange and some red leaves of average brilliance. In Voorheesville, spotters at Thacher Park predict just past peak bright yellow and orange leaves with touches of red. Schenectady County is now past peak, but some good colors will remain for the weekend. In the Catskills, look for peak to just past peak foliage in the Kingston area of Ulster County. Color change is projected to be around 75 percent with increasing amounts of yellow and burnt orange leaves along with scattered red and burgundy leaves. Saugerties spotters are also predicting peak to just past peak leaves with bright and beautiful gold, orange and red tones. In Sullivan County, expect bright foliage with peak to past peak conditions; most trees in the county are still quite vibrant with a fair amount of their leaves remaining. The southern part of the county along the Delaware River will be peak nearly complete color transition and bright reds, golds, and rust shades. The northern portion of the county is now past peak. The Catskill Mountains of Greene County will be past peak this weekend, but look for vibrant, peak shades of red, yellow and orange in the valley and river areas. Spotters in Lanesville in the Stony Clove Valley expect radiant peak and just past peak leaves of Amethyst, gold and crimson on the maples and oaks. In the Thousand Islands-Seaway region, spotters in Oswego County are calling for near peak conditions with 70-80 percent color change in northern areas of the county and 60-70 percent in the southern part. In northern areas such as Pulaski, Sandy Creek and Altmar, oranges and reds continue to brighten the landscape, while a kaleidoscope of colors, including yellow, orange and red has emerged along the Oswego River valley in the southern portion. St. Lawrence and Jefferson counties will be past peak with some yellow, orange and red leaves of average brilliance remaining. Central New York leaf peepers are all projecting past peak leaves for the weekend. In Oneida County, look for some pockets of bright orange and red leaves against a mostly muted backdrop of yellow, gold and blush. Southern Herkimer County still has some areas of vivid red and yellow leaves, while Madison County expects to be just past peak with bright but fading shades of orange, yellow and red. Excellent foliage viewing can still be found at Chittenango Falls State Park. In the Chautauqua-Allegheny region, foliage will be past peak by the weekend. At Allegany State Park in Salamanca, Cattaraugus County, look for 85 percent color change and muted dark orange leaves. Spotters in Chautauqua in Chautauqua County expect just past peak leaves with 95 percent color change and bright shades of orange and red leaves along with some remaining green. In the Adirondacks region, most reporting stations are now past peak. In southern Warren County, spotters checking in from Lake George project just past peak colors for the weekend, with soft tones of yellow, rust, orange and red. There still may be some good fall color remaining in Crown Point, in Essex County, which is also past peak.